Tut, Tut, Looks Like Rain. It looks to be a dark and stormy night. And as such, I expect to see a lot of damp people running about. No one, it seems, is prepared for the weather these days. Over the course of four years working out with his team, I discovered that that’s true. The long-sufferng Mrs. E has threatened me to release me if I come home with another coat. My inclement weather arsenal includes: a Barbour Bedale jacket; a Burberry trench from the 80’s (my Dad’s and in need of new buckles and a bit of mending to the shoulder cape); a Ralph Lauren Steamer Coat (reversible tweed/waterproof twill); an Olive microfiber DB Nautica number and my Father’s Regulation US Army “Pinks and Greens” Topcoat ca. 1954(?). So what are your choices for getting all mac(-intoshed)’d up? We’ve discussed the Barbour jacket, a serious piece of foul weather gear if ever there was one. But what are your other options? Particularly if you need a longer article of outerwear to keep you dry? The umbrella is great at keeping the rain from your upper half and there are some beautiful examples of them about. Swaine Adeney Brigg has been making the English umbrella since the 1830s. They have, unfortunately, ceased production of sword umbrellas. As a former sabreman, I would have liked one of those for strolls around the neighborhood anytime after dark. Whangee handle à la John Steed, of course. Golf umbrellas are useful for sheltering two. Which, in my case, is a very good thing. 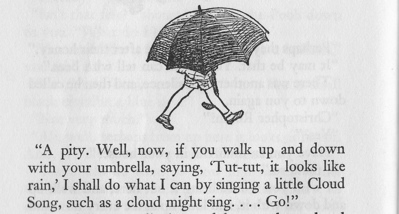 Mrs. E refuses to carry an umbrella or parasol on some obscure grounds. Loro Piana makes the Storm System® fabric, which involves a micromolecular membrane backing to the wool and some sort of a treatment that helps it shed water like a duck. Or try out option two and go traditional. The Burberry Classic Trenchcoat. You may also have one made to your specifications. Burberry invented gabardine in the 1800s and the Tielocken, the forerunner to the trench coat, was developed in 1895. It was quickly taken up by British Officers during the Boer War. In 1914 the British War Office commissioned the company to update its Officer Coat for modern combat needs. Burberry added epaulets to secure pack straps (or tuck your gloves or beret under — which is what I do) and D-rings to hold grenades or other pieces of equipment (perhaps a sabre tache?) The coat accompanied the officers to the trenches of WWI. In 1920, the Burberry Check became a registered trademark and was added to the coat’s lining. And here we are today. Their Belted Duffle coat is pretty snazzy, too. Alright, so you don’t have a couple of thousand dollars to get wet. That brings up option, the third. Have a favourite topcoat waterproofed at your drycleaners. Opens up a lot of options, doesn’t it? I’m not sure that I’d try this with cashmere, as I imagine that it is done by dousing the coat in industrial strength Scotchguard, but I might. Especially if I bought the coat in a thrift store. This entry was posted in Elegantology and tagged books, clothing, coats, Elegantology, outerwear. Bookmark the permalink. 10 Responses to Tut, Tut, Looks Like Rain. I think you and my husband must be related. He is forever buying new coats/jackets and has quite a collection of older styles as well. He still has his great uncle’s “beagle club” jacket from the 50’s. Funny enough we (the affectionate “we”) will be purchasing a Barbour jacket in the next few days. It is, I guess, a practical purchase when you live in Scotland. I sympathize with Mrs E.
A great bit of kit with the best zipper my father-in-law has ever seen. (We bought him one for his birthday last year.) I still wish I had bought the beaufort model as that would have gone over my tweed jackets. Mrs. E. has tried to restrain herself from borrowing my Bedale as she knows that that opens the door to a new model. Which I will have customized with an outside chest pocket to hold my cell phone. I didn’t catalogue my topcoats, overcoats, car coats and jackets, either. Always wanted to visit Scotland. My father-in-law is of Scots extract. MacDonald of Clan Ranald, I believe. What? No umbrella? I’m always a tiny bit happy when rain threatens as it allows me to carry around my umbrella. I go for the Mary Poppins variety – full length, black, wood curved handle. Nothing smarter. Love the idea of waterproofing – genius. Agreed. And I would never argue with Mary Poppins. There is a wonderful early episode of “The Avengers” in which Steed instructs a Russian “diplomat” in the proper way to carry his umbrella. Hilarious. The “gust-buster” – never flips up, sturdy for any torrential downpour. Designed Coats in my last life and they were very “Sherlock” Holmes. Inside an artillery of art supplies at the ready. Having lived in NY City, always a good chuckle to see people scamper under any overhang as well as pedestrians avoiding the loss of an eye or 2. Surprised one has not been invented with an elegant trim of sorts. Yes, Aquascutum still exists! A venerable label, but I’m not sure that it hasn’t been bought up by a conglomerate. I believe that Astaire or Grant wore their raincoats. Prince Albert of Monaco? But isn’t he more of a scientific type?